The bridge WP90 makes this guitar a cool twist on an 80s design, and that neck profile is just sublime. The fabulous neck. Great range of tones. First- class build quality. 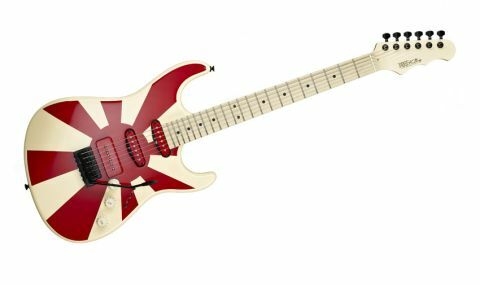 In his quest to build a guitar for, um, absolutely everyone, Trevor Wilkinson has had his wicked way with a classic design and tweaked it to snag punters that value performance over branding. The latest addition to his intermediate Fret-King Black Label Series is a tweaked replica of an 80s hot rod, the Corona GWR. "The perfectly finished medium jumbo frets and 'flat' fingerboard make for superb buzz-free playability"
Back in 1984, bluesman Gregg Wright was a hired gun in Michael Jackson's Victory Tour band. Before packing his suitcase to head out on the road with the King Of Pop, Gregg ordered a custom-made guitar, which now hangs on the wall at a Hard Rock Cafe; and it's that guitar, sorely missed by Gregg, that Trev Wilkinson used as the starting point for the new Black Label Corona GWR Gregg Wright model. "It has the exact same neck width and radius as the original," says Gregg of the 80s-era instrument cryptically described as a "sought-after guitar hero custom brand" on the Fret-King website. Now, it doesn't take Bergerac to realise that the guitar now dangling over diners at some Hard Rock Cafe is a white Charvel with a rising sun graphic. If you were around back then, you'll know that not all 80s rock guitars had lollipop stick-thin necks. The Corona GWR's maple example, bolted to a three-piece American alder body via a beautifully sculpted heel, reminds us of those wonderfully chubby Charvel necks of yore. The 22 perfectly finished medium jumbo frets and 'flat' 432mm (17-inch) fingerboard radius make for superb buzz-free playability. And don't write this guitar off as a shred machine. Anyone who likes effortless string bending should give it a test drive. Remember, Gregg Wright plays blues on his. "The WP90 offers bags more warmth through a clean channel than most humbuckers"
While the feel and looks of the Corona GWR transport us back to an era when men had hair like Tina Turner and root vegetables were a fashion accessory, we were surprised to see a Wilkinson WP90 stacked single coil, colour-matched to that vibrant solar graphic, instead of a humbucker. A few amplified minutes later and we get it. The WP90 conspires with the two regular single coils to produce a fat Fender Strat-like vibe, while the bridge pickup delivers enough power and raunch to satisfy the staunchest humbucker junkie. Better still, the WP90 offers more clarity when distorted, and bags more warmth through a clean channel than most humbuckers. While the middle and neck single coils have a modern, punchy presence, dropping their output a touch with the volume control dials in a more vintage tonality; think surf, Hank, Jimi and plinky funk. Winding down the Vari- coil transforms the tone of the bridge pup from a porky P-90 to something closer to a classic, wispy single-coil voice. Gregg Wright, for one, is well chuffed with his Fret- King signature, and considers it a big improvement on the guitar he gave away. In other words, if you haven't done so already, the time has come to see what all the fuss is about.